EL-6890P package or are damaged. What Does PC Interface Software Do? 1. Turn off your PC and the EL-6890. located on the left side of the EL-6890. 3. Type in a:\Setup.exe and click on [OK]. 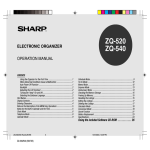 default folder name: [Sharp EL-6890]. utility programs you may be running. with certain virus scanning programs enabled. software you may be running. 1. Connect your EL-6890 to a PC. 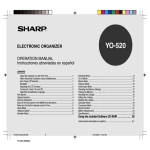 [Program] ➝ [Sharp EL-6890] ➝ [EO-Utility]. your notebook PC and set it to the serial port. The COM port setting dialog box appears. open the Address Utility window. EL-6890 with the backup file saved on a PC. the backup file name, if necessary. backup file, its file name and its destination. 7. (After entering the information), click [Send]. choose the backup file name. [Abort] on the instructions screen. The confirmation dialog box appears. Sets this data as secret. the warning message dialog box appears. Main Screen and select the appropriate port. 4. Click [NEXT >>] to start the backup process. ABCD co. 15 North St. The data transfer is started. in can not be sent.